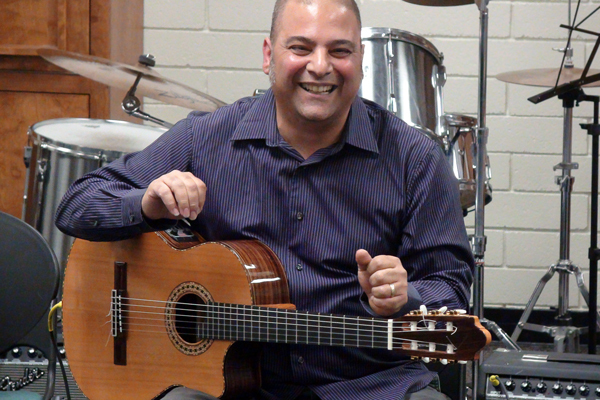 Welcome to the web site of Bay Area guitarist and teacher Chris Shahin. Listen to Chris’s latest project, Sanctuary. All songs written and arranged by Chris Shahin except Nessun Dorma by Giacomo Puccini and Shenandoah – Traditional (composer unknown). Chris Shahin: guitar; Sally Dalke: violin; John Shifflett: bass (tracks 1 and 3 and 4). Recorded, engineered and mastered by Steve Glaze at Tone Freq Studios, San Jose, CA. Ainsley House Concert featured on the front page of the Campbell Express. Check out the article. Student and Pro-Guitarists in Concert- FREE! Hosting the South Bay Guitar Society Open Mic. Vineland Library @ 1450 Blossom Hill Rd. 2/3/12 Pennsylvania A tribute to my home state!